If you are planning to visit Finland on vacation or for business you can look forward to staying in some amazing hotels. 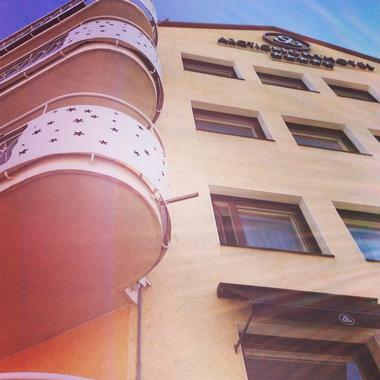 Whether your travels take you to the country’s capital of Helsinki or to far-northern Lapland, you are assured of finding a stylish and comfortable hotel and a warm welcome. 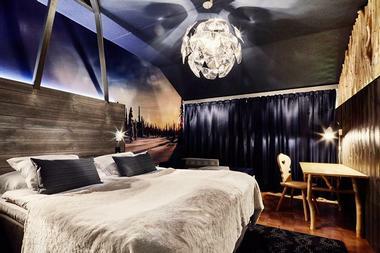 You will find Hotel Lilla Roberts located in Helsinki’s trendy design quarter called Lapland City. 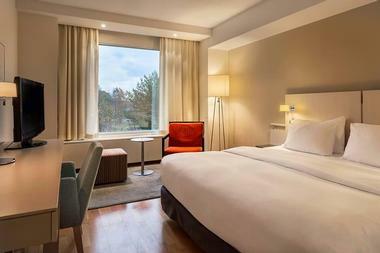 The hotel occupies premises which were once the headquarters of the Helsinki Energy Plant which has been masterfully renovated to offer 130 rooms, a restaurant, bar, meeting rooms and a gym. Suited to both leisure travelers and business visitors, the hotel combines Scandinavian elegance and Art Deco décor in all public areas and in the stylish bedrooms which offer large TVs, elegant bathrooms and luxury bed linens. There is a parking garage next door and an on-site restaurant where you can enjoy your meals. Coffee and cocktails are served in the comfortable Bar Lilla e.
A long-standing favorite luxury hotel for those in the know, Hotel Kämp occupies an impressive historic building in the heart of the city. Although the hotel is over 130 years old and has been a Helsinki landmark for decades, the beautiful interior has totally kept up with changes in fashion and each of the stunning rooms and suites is modern and luxuriously furnished to offer every convenience the modern traveler demands from a five-star establishment. 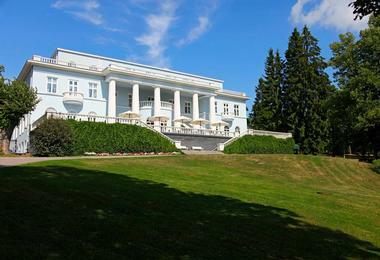 You can dine in style at the Hotel Kämp Brasserie which overlooks the Esplanadi Park, enjoy a relaxing treatment, sauna or steam bath at Kämp Spa or sip your favorite cocktail at the elegant Kämp Bar. The Hilton Helsinki Stand occupies an enviable location at the Helsinki Harbor, which ensures beautiful views as well as convenient access to the city center. 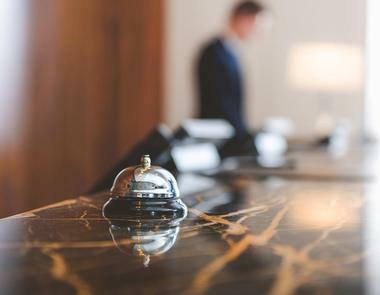 Perfectly suited to both leisure travelers and business visitors, the hotel offers comfortable luxury rooms with work desks and chairs as well as elegant and contemporary styling, comfortable beds and large flat-screen TVs. If you choose an Executive Room on the 7th Floor you will enjoy free access to the Executive Lounge for complimentary breakfast and all-day refreshments. Leisure facilities include a gym, swimming pool and sauna and the light and airy Restaurant Bro is open for breakfast, lunch and dinner. Housed in the former rather stark building which was the City Hall of Rovaniemi, the Arctic Light Hotel is a shining example of what a clever designer can accomplish. The rooms and suites offer the last word in Nordic elegance and luxury, inspired by the Arctic light and nature. All the rooms feature luxuries like Nespresso Coffee makers, personal lap-top safes, bathrobes and fine linens and many have a separate seating area. A healthy and delicious breakfast buffet is included in your room rate and the acclaimed Arctic Restaurant serves delicious and unique Lapland specialties. The hotel is ideally located for watching the amazing Northern Lights and for visiting Santa Clause. 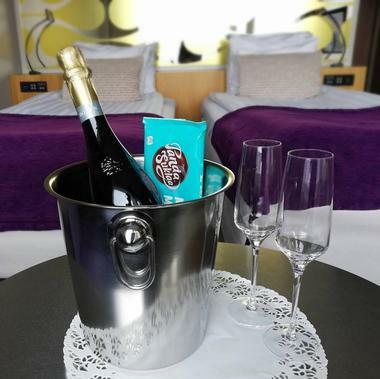 Perfectly located in a peaceful and scenic area on the edge of the Gulf of Finland, the Hilton Helsinki Kalastajatorppa Hotel is ideal for both business and pleasure. Business visitors will find comfortable workspaces in each room and are able to easily access the city center, while leisure visitors can enjoy sea-side resort facilities and a lovely vacation atmosphere. You will be within walking distance of boat excursions, coffee shops and boutiques and resort facilities include a beach, tennis courts, pool, gym and walking/jogging tracks. There are two on-site restaurants and the contemporary rooms and suites are comfortable and spacious – many offer good sea views. If you are looking for a home-from-home atmosphere combined with excellent services and modern Finnish elegance, Hotel F6 is an ideal choice. This stylish boutique hotel is located right next to the Esplanade, offering easy access to most city attractions by foot or cycle. Each of the rooms and suites is pleasingly decorated in a modern, contemporary style which invites guests to kick back and relax. You can enjoy a delicious buffet breakfast (organic ingredients are used whenever possible) to set you up for your busy day, perhaps borrow a bicycle to explore the city like a local or simply sit and relax in the comfortable courtyard. The hotel has a well-equipped gym and a convivial bar where you can sip cocktails. 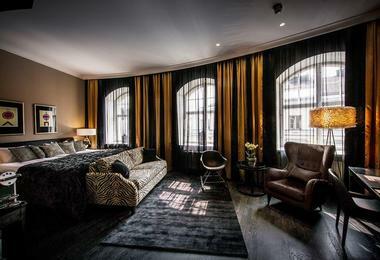 Located in the former city prison, Hotel Katajanokka offers visitors a unique hotel experience within a short walk of the city center. Some of the rooms are on the snug side (former prison cells) but are extremely comfortably furnished and decorated. You can expect en-suite shower rooms, queen, king or twin beds and luxurious linens, alongside thick walls and unusual windows which lend a unique atmosphere to the hotel. All room rates include free Wi-Fi, 24-hour gym access and free weekend sauna. You can enjoy dinner in the cozy Linnankellari Restaurant (formerly the prison canteen) which serves delicious Nordic cuisine. 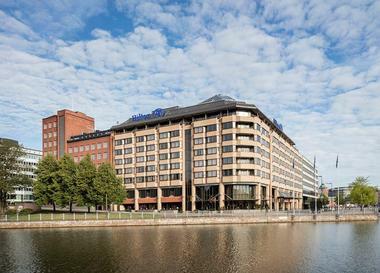 Conveniently located within walking distance of most of Helsinki’s tourist attractions, the Radisson Blu Plaza Hotel is an ideal choice for both leisure and business visitors. The hotel has been nominated as the best business hotel in Finland on several occasions, offering a number of extra facilities for business visitors including the super-convenient Plaza Lounge (free access if you choose a Business Class Room or Suite). The Plaza Restaurant serves fresh and delicious Nordic Cuisine and the extensive buffet breakfast is ideal to set you up for a day of meetings or exploring. 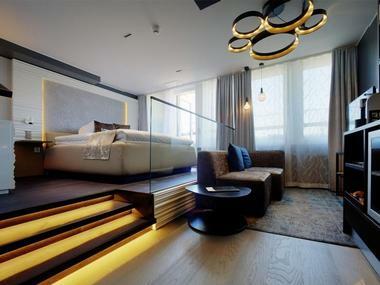 Comfortable and aesthetically-pleasing rooms and suites feature stylish Finnish design and all mod-cons. Located in the center of Lappeenranta, Finland’s thirteenth-largest city, the Scandic Patria Hotel is a modern and comfortable base from which to explore the Lake Saimaa region. The rooms and suites feature modern minimalist Finnish décor; some rooms have private balconies and private saunas and all rooms have TV, mini-bar, personal safe, Wi-Fi and luxury toiletries. 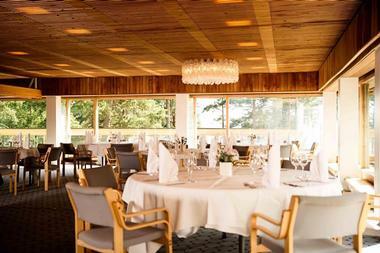 You can try some typical Nordic cuisine in the Torilla Restaurant or relax with your favorite cocktail at the adjacent Bar. Other facilities at this hotel include a parking garage, gym/fitness-center, sauna and Jacuzzi. Business visitors can use the meeting room or the tiered auditorium for meetings or presentations. 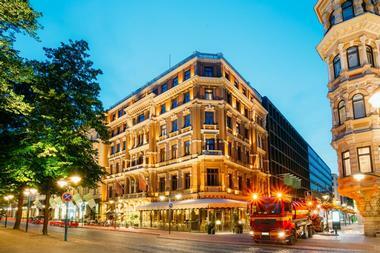 When you are looking for something a little different and unique, the centrally located Klaus K Hotel in Helsinki could perfectly fit the bill. 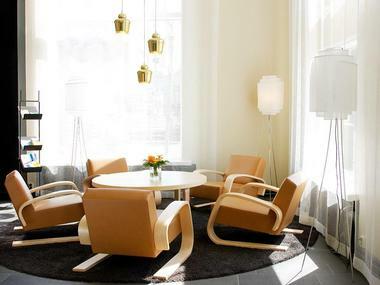 The hotel offers 171 rooms and suites, each of which features elegant Finnish design inspired by the country’s renowned artist Akseli Gallen-Kallela’s famous “The Kalevala”. Even the smallest single room includes many luxury features and the more pricey rooms and suites are perfect for those accustomed to luxury. The Klaus K Bar and Lounge is the perfect place to meet up with friends for cocktails before you move on to the Toscanini Restaurant to enjoy Tuscan-inspired cuisine. If you are looking for an elegant boutique hotel situated in the heart of Helsinki you will find that Hotel Fabian ticks all the boxes. The hotel is located about 5 minutes from the Esplanade and is surrounded by some of the city’s best and trendiest restaurants. The rooms and suites are comfortable and beautifully appointed – expect muted colors, good entertainment systems and Eco-Boutique toiletries. If you are traveling with the family or planning an extended stay you can choose a spacious Lux room which comes with a kitchenette for self-catering. The elegant Lobby Bar is an ideal place to meet friends for a drink and great dining is available within easy walking distance. 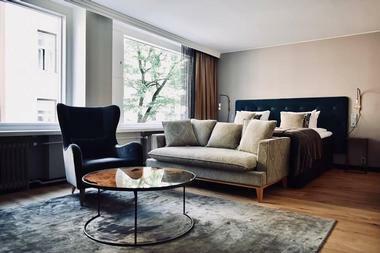 Located in the Siltasaari district (close to the Convention Center), the innovative Scandi Paasi hotel is within easy walking distance of many of Helsinki’s popular attractions, including Market Square and Helsinki Cathedral. The bright modern interior design has been influenced by colorful events which once took place in this part of the city. You can choose from several room configurations to suit your tastes and budget, including the Master Suite which has a kitchenette and private sauna. All the comfortable rooms feature quirky colorful additions to enliven a basic neutral palette. You can enjoy a drink at the lobby bar before stepping out for dinner at one of several nearby restaurants. 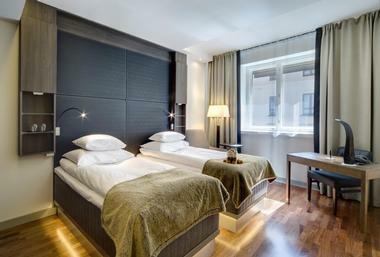 Perfectly located in the heart of bustling Helsinki, the GLO Hotel Kluuvi is a good choice for both tourists and business visitors. By day the hotel is a perfect base for visitors wanting to explore Helsinki’s shopping areas, galleries and museums and when the sun sets you will find yourself close to many of the city’s trendy restaurants and bars. You can select your room or suite from one of eight categories, depending on your budget and the degree of luxury you require. Even the least expensive room in the hotel comes with little luxuries like black-out curtains, free Wi-Fi, mini-bar, air conditioning and gym access, while the top-of-house GLO Executive Suite covers a massive 68 square meters and can accommodate up to 6 guests. Scenically located in the heart of the city of Jyväskylä in the central Lakelands, the Solo-Sokos Hotel is a great base from which to explore this remarkably scenic part of Finland. All the comfortable rooms offer innovative technology to give you a great home-from-home experience and feature quality linens and luxury bathrooms with either shower or tub. Many of the rooms offer beautiful views over the lake and some have extra luxuries like coffee makers and separate seating areas. After a busy day of sight-seeing or hiking the lakeside trails you can look forward to a work-out in the gym, a relaxing sauna and a great Italian meal at Trattoria Aukio. This charming and family-friendly spa hotel is located just a couple of hundred meters from the Levi Fell ski slopes, making it a great choice for anyone wanting to combine a skiing vacation with relaxing spa facilities. Families can choose a Family room (with an alcove sleeping area for the children) or a Family Suite which has two bedrooms; both of these have kitchenettes. Other family-friendly facilities include the Ailu Family Fun and Bowling area and a choice of family-oriented restaurants including a pizza restaurant and Burger King. 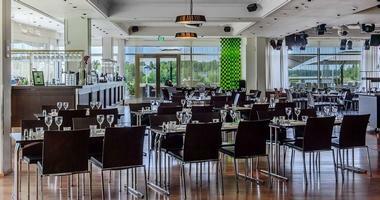 Adults can enjoy drinks and dining at the Kekäle Restaurant and Bar or have some fun at the Joiku Music Bar. 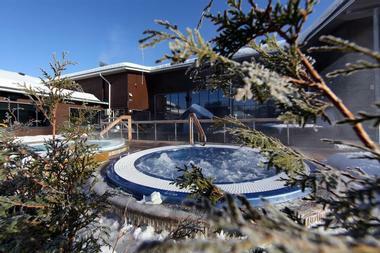 After a busy day on the slopes you can enjoy a relaxing treatment at the Spa. Scenically located at the mouth of the Oulu River on the Gulf of Bothnia, the Radisson Blu Hotel in central Oulu welcomes both business and leisure visitors. Business visitors have the use of several versatile meeting rooms while tourists will find it easy to explore all the attractions of the city by taxi or public transport. The elegant rooms all feature attractive Scandinavian design and décor and even the least expensive economy room offers luxuries like air-conditioning, an entertainment system, the Blu-Dreams bed experience, TV, mini-bar and hair-dryer. Business Class rooms and suites have separate sitting areas, coffee machines and king-size beds. All rooms offer free access to the on-site gym and there are two restaurants, a bar and sea-side terrace. 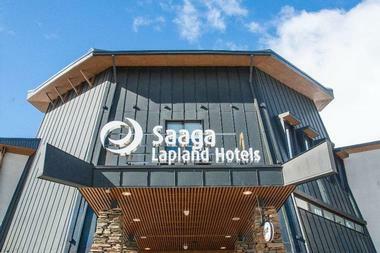 Lapland Hotel Saaga enjoys an elevated location high in the fell, offering amazing views of the snow-covered ski slopes in winter. There is a gondola-lift right next to the hotel which means that guests have very easy access to the inviting slopes and forests. You can choose from a variety of accommodation options which vary from twin rooms in the main building to three-bedroom fully-self-catering apartments which are located about 200 meters from the hotel. Larger apartments and ski-chalets have full kitchens and private saunas. After a busy day on the ski slopes or hiking/biking trails you can enjoy a relaxing spa experience or hit the gym for a workout. Visitors to Helsinki who are looking for something a little different in the way of accommodation should consider the Solo-Sokos Hotel Torni. Each of the hotel rooms has been individually styled and decorated, some in the Art Nouveau style while others feature Art Deco elements. While all the rooms offer little luxuries like flat-screen TV, personal safes and mini-bars, the more lavish rooms and suites also have coffee makers, pillow-menus, lots of original artworks and larger beds. You can enjoy meals at the Torni Restaurant and meet friends for drinks at the Ateljee Bar, American Bar or O’Malley’s. If you are making a pilgrimage to Rovaniemi in the Arctic Circle to see the famous Northern Lights (or to visit Santa Clause?) 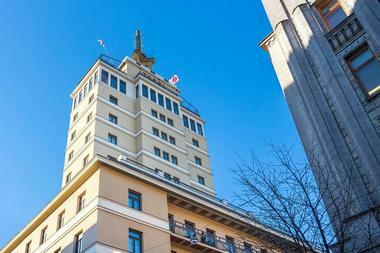 the Original Sokos Hotel is a great choice in the heart of the city. The hotel prides itself on offering guests warm Lappish hospitality and easy access to all the year-round attractions of Rovaniemi. To really set the scene for your visit you can choose the enchanting red and white Christmas Room (which has a small sleigh which converts to a kiddies’ bed – what could be more exciting for little visitors). The restaurants offer a very varied menu which includes rustic French cuisine, traditional Lapland specialties and even some very popular Tex-Mex dishes. 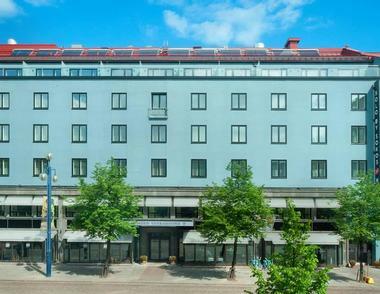 Situated on a quiet street close to the city center, Hotel Helka occupies a 1930’s building which was the original Helsinki YWCA. Today this rather unremarkable structure is home to the fun and quirky Hotel Helka where Nordic chic and modern minimalism are combined to offer comfortable and elegant rooms and public spaces. 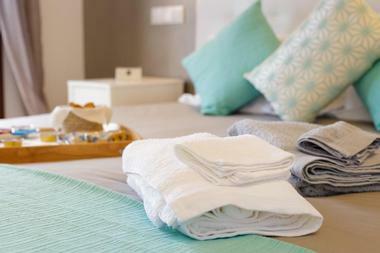 All the comfortable rooms include very special Hilding-Anders beds, Flat-screen TV, air-conditioning and free Wi-Fi. There is a roof-top sauna for everyone to enjoy and the inviting bar serves a variety of delicious signature cocktails. Be sure to visit the first-floor breakfast room where a freshly-prepared breakfast will set you up for a day of business or leisure. 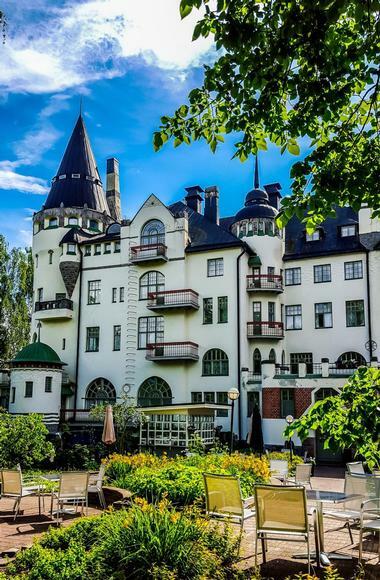 Located five kilometers from the picturesque ancient village of Porvoo, (about an hour from Helsinki), the Hotel Haikko Manor is a destination resort for a wellness vacation, business conference or a combination of both. The hotel has excellent conference facilities and will put together an ideal package combining work and relaxation. Visitors have the choice of sumptuous luxury rooms in the Manor or more modern, contemporary rooms in the main hotel section. You can take your meals at the Manor Restaurant or Spa Bistro and drinks are available in the Spa Lounge or the elegant Lobby Bar. Next to the outstanding location, the Spa is the main draw-card offering an extensive list of treatments, several pools, tubs and saunas. 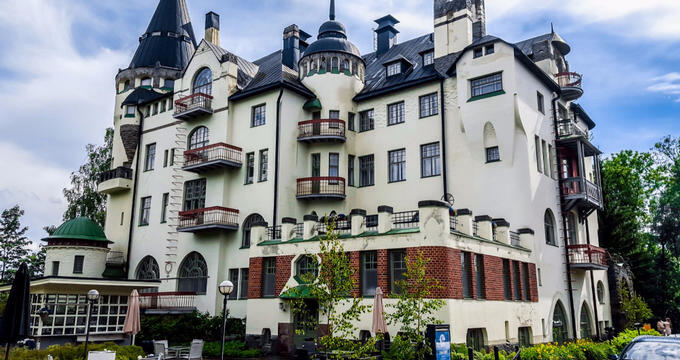 Located in the beautiful and historic lake-side city of Imatra in eastern Finland, the Rantisipi Imatran Valtion hotel is housed in an impressive castle-like building which has long been a city landmark. The hotel is an ideal base from which to explore the beautiful area and is also a popular conference venue. All the rooms and suites are elegantly furnished and decorated to provide a serene atmosphere and all the necessary modern features you require for a comfortable stay; many of the rooms have balconies and outstanding views of the river and lake. You can visit the gym for a workout or relax in the sauna, hot tub or indoor swimming pool. Restaurant Linnasali serves breakfast and dinner and the Lobby Bar is the place to relax with your favorite cocktail. 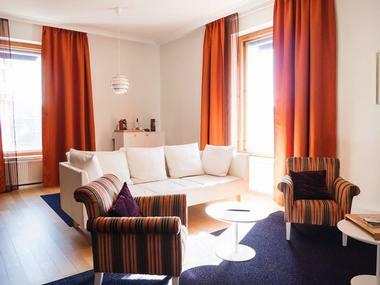 The Solo hotel group have been welcoming distinguished guests with genuine Finnish hospitality since 1890 – now it is your turn to be their guest and experience a genuine home-from-home experience in Lahti. 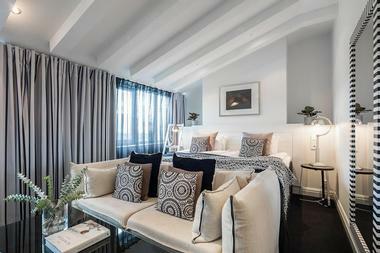 You can expect your room to be comfortable and elegant, benefiting from stylish Finnish décor. You can choose from a simple single room if you are traveling solo, or splurge out and book the stylish Karolina Suite which boasts a private Jacuzzi and separate living room. The hotel has two restaurants where you can enjoy your meals – savor a taste of Italy at the Trattoria Seurahuone or have drinks and dinner at the Bar and Bistro Huone. Contemporary and trendy, it is quite hard to believe that Helsinki’s GLO Hotel Art is actually constructed around the remains of a 100-year old Art Nouveau castle. You will find the hotel perfectly located in the heart of the city’s pulsing Design District, just half a mile from the city center. You can choose from a selection of stylish double or twin rooms for up to three persons or opt for the spacious Glo Suite which has a king-size bed, separate lounge area and the option to add another single bed. Get your day off to the perfect start with a great breakfast in the Glo Art Kitchen and round off your busy day with drinks and light snacks at the atmospheric Art Lounge Bar. Located in the city center of Oulu, one of the world’s most northern cities, Lapland Hotels Oulu offers visitors an attractive base for exploring this unique region. All the comfortable and elegant rooms feature design elements inspired by nature and the mystique of Lapland. All rooms feature special comfort mattresses which adapt to your body, large flat-screen TVs, quality linens and a pillow menu; you can choose from twin, queen or king-size bed configurations. At Oulu Kitchen and Bar you can relax with your favorite cocktail before enjoying unique dishes using locally sourced reindeer and game, fish from the local lake and Nordic berries and mushrooms.